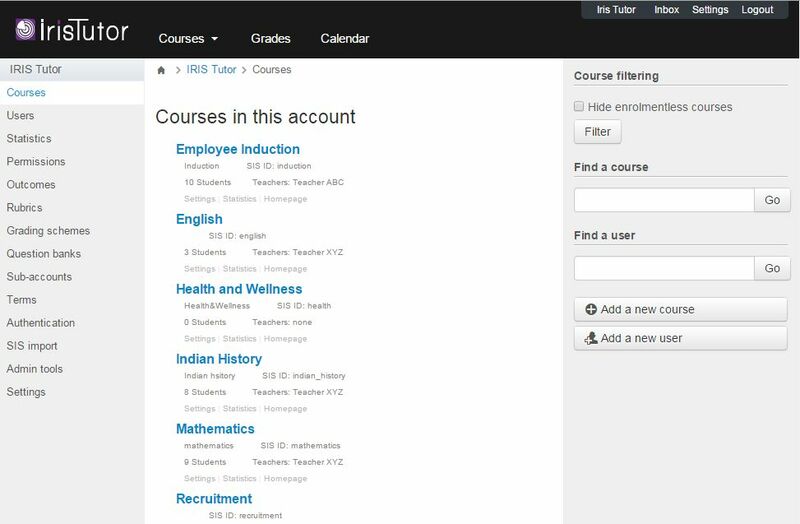 IrisTutor is a Learning Management System (LMS) for schools, colleges, universities and corporates. It allows you to integrate multimedia course content, course communication, student assessments (quizzes, assignments, surveys, portfolios), and student grades to create a cohesive, connected virtual space for your class. You can track student progress, auto generate grades and collaborate on documents within your courses. IrisTutor features a robust editor with quick discussion and text chatting capabilities to help you easily connect with your teachers, students and other faculty. Upload, organize and share course materials through a clean, intuitive layout and modern user interface. Also, Post assignments, manage submissions and grade assignments with the Speed Grader. Assign collaborative work in Google Docs. Quickly get updates/notifications to and from students and students group. IrisTutor is a fully hosted and maintained (SaaS) application which is easy to commission, integrate and manage. (No hardware, software investment needed). IrisTutor is hosted in a secured environment which ensures data protection (Logo of this section should be changed to lock).